More than 62,000 visitors come to Northwestern University’s campus each year to tour the campus and learn more about the institution. Our team transformed the visitors experience through state-of-the-art installations in the Segal Visitors Center that involved hundreds of pieces of content and custom-designed interactive technology. Project manager and graphic designer. Determine story to be featured in each case (5), request memorabilia, design and produce complementary assets (text placard, photos, examples work, etc. ), and install. Collaborated with prospect managers from Alumni Relations and Development to connect with 60+ alumni to be featured. After the initial rollout, I now design the final art when new alumni are added. Art direction for main screen and interactive information pop-ups. 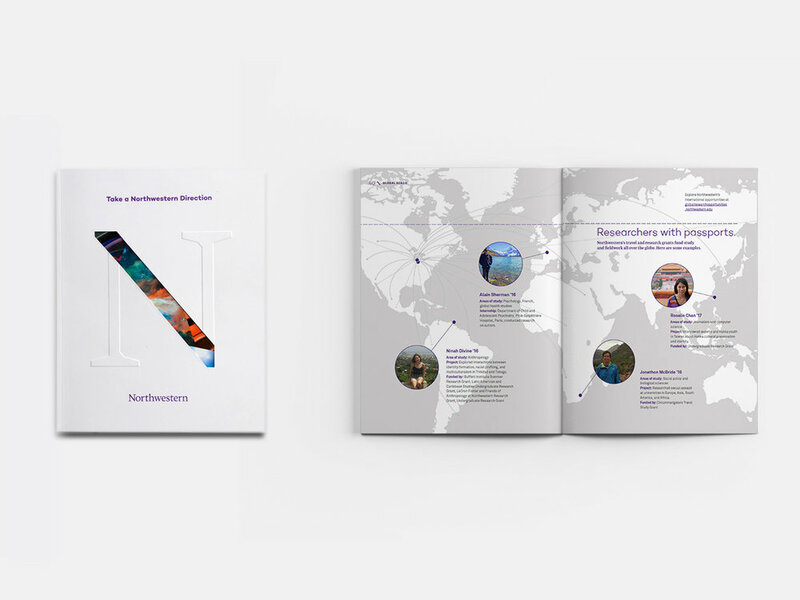 Art direction for die-cut cover and global spread for the undergraduate viewbook, displayed in the Segal Visitors Center and mailed to prospective students.